Tuan Giai Giang was born in Vietnam on February 16th, 1995. He immigrated to O‘ahu in 2003 with his mom. Tuan is a graduate of Kaiser High School, class of 2013. 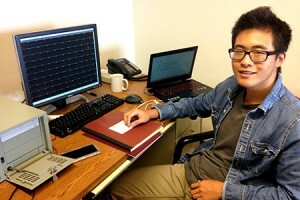 After graduating high school, he enrolled at the University of Hawai‘i at Hilo where he is currently pursuing his bachelor’s degree in Computer Science and a minor in Mathematics. When he graduates from college, he hopes to pursue an engineering position at one of the telescopes in Hawai‘i or either Google or Microsoft in California and Washington, respectively. The most influential people in his life are his parents and friends. When he has free time, Tuan likes to run and play Super Smash Brothers Melee and basketball. The YT Lee Array on Mauna Loa has seven radio dishes and each unique pairing of dishes generates one dataset. This creates 21 datasets requiring processing in real-time that need to be displayed for scientists and observers to analyze. The current graphing software displays multiple datasets as one figure on a single canvas which makes assessing the quality of the dataset cumbersome. A new graphing software was implemented using PyQtGraph with real-time updating capability for users to monitor incoming data on separate subplots on a single canvas and improve user interaction. The new software displays 21 datasets, each with its own independent figure on a single canvas. PyQtGraph has built-in user interaction functions such as panning along the x-axis and zooming in along specified x-axis intervals. Along with the built-in interactions, we were also able to implement a separate form application that allows users to take a detailed look at a dataset by selecting its baseline and starting timestamp. Some additional features such as toggling between plots of Amplitude vs. Time and Phase vs. Time, switching the display of data in terms of upper and lower sidebands, and changing the window size from fit to stretch were also implemented. The new software has enormously improved data quality inspection and integrated new interactive features with the data. However, further improvements can be made to the software by displaying more than 150 time integrations, optimizing its graphing performance to avoid lag when it is near the buffer limit, and implementing a rollback feature concurrent with the real-time updating.